The Colorado String Quartet continues its recording career with a coupling of two of the most tragic and dramatic works in the chamber music repertoire. Schubert's Quartet in D Minor, D. 8lO, Death and the Maiden is among the most familiar of all string quartets. Mendelssohn's Quartet in F Minor, Op. 80, is a seldom-performed masterpiece. Both share the theme of death, Schubert's in its subject matter, Mendelssohn's in its circumstances and tone. It was the only major work Mendelssohn wrote between the sudden, shocking death of his beloved sister (and fellow-composer) Fanny and his own death half a year later. 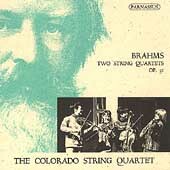 The Colorado String Quartet's first CD for Parnassus, Brahms's two String Quartets, Op. 51 (PACD 96007) was a great critical success and has already gone through three printings. Martin Anderson wrote of it in Fanfare, "This is simply one of the best discs of chamber music to come my way in a long, long time....I have played it again and again since it arrived, and every time it sets my musical adrenaline coursing. Do yourself a favor and buy it." And David Patrick Stearns wrote in USA Today, "String quartet lovers will be baffled that this group isn't better known. It's not just their fine sense of ensemble; each member also projects an absorbing individuality that never taxes overall cohesion. Both quartets go well, but Op. 51 No. 1 is amazing, thanks to a rhythmic urgency that brings out the music's youthful energy and keeps melancholy moments from lapsing into tedious self pity."